For quite some time, I’ve read posts and comments from friends about kale chips. I like kale. I want to learn more about kale. Kale is the superman of vegetables, according to many. We need more kale. But, I’ve never had kale chips. There are two groceries at which I prefer to shop. The one I frequent most often only carries kale that is already chopped and bagged. And when I say chopped, I mean CHOPPED. I’ve picked up those bags a zillion times, looking, pondering, and coming to the conclusion that kale bits could never be considered a “chip.” They’d be kale crumbs, at best. Today, I went to my 2nd favorite grocery and I spotted it. Now, it wasn’t just a bunch of kale. No, this was a gargantuan bunch of kale. Huge. So, now I have no excuse to delay any longer on my quest to learn more, cook more and eat more kale. I’m making chips. This is my new favorite snack, hands down. So easy to make, so delicious, so different and packed with super goodness. I feel like I’m going to live forever all ready. I’m eating them right now. Okay, I confess, I’m on my 2nd batch. But as far as I know, no one ever got fat from too much kale. I’m sure there are many variations on the theme, as is always the case, but here’s how I did it. I cut the leaves away from the rib and then tore the leaves into “chip” sizes. Then, I washed the leaves and spun and spun and spun in my salad spinner to dry them well. Add half the kale to a large Ziploc, add 1 ½ tsp olive oil, add rest of kale, 1 ½ tsp olive oil, close bag and gently shake and massage to coat all leaves. Spread out in an even layer on a baking sheet, sprinkle with seasoned salt and bake at 350 degrees for about 13 minutes. Viola! 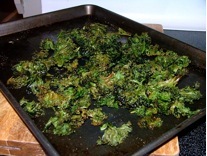 Kale chips ready to munch on. Crispy, crunchy chips made from the super-veg! So, you’re probably saying something like, “Hey, Elizabeth, how much kale did you use?” Well, you’re going to get the answer that drives my husband crazy – “Until it looks right.” In this case, I tore enough leaves to fill up my salad spinner and took it from there. I’m sure some of you are reading this and thinking, “Kale?” Never, ever, ever. If you are that person, I challenge you to try this snack just once. If you don’t like it, so be it. You tried it. If you do like it, you’ll be glad I made you do it! This entry was posted in Advice, Columbia, Cooking, Elizabeth Webber Akre, Famously Hot, Food, Lexington, Lexington Medical Center, Midlands, Recipes, Women and tagged Columbia, columbia sc, cooking, elizabeth akre, Elizabeth Webber Akre, every woman blog, Famously Hot, food, hospital blog, Kale, Kale Chips, Lexington, lexington medical center., lexington sc, Lexington Women, lmc, LMC every woman blogger, Midlands, Midlands Women, Snacks, South Carolina, South Carolina Women, Super Vegetables, Vegetables, Women, women's blog, women's hospital blog by Ashley Andrews. Bookmark the permalink. Elizabeth, you rock! I’ve been wanting to try this for some time now. Thank you for inspiring me! I totally plan to try this out. 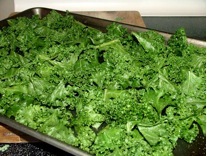 I’ve read all about the amazing health benefits of kale and try to sneak it in regular dishes & salads whenever I can. But to be able to snack on it would be fabulous! My latest snack addiction has been boiled peanuts, (which I was considering writing my next blog entry on) and needless to say, the kale chips would be a MUCH better snack choice for me! Thank you for sharing and can’t wait to try them!